New Cruise Booked for June 2019! Mark your calendars for June 27-July 4, 2019. I’m happy to announce that I’m playing on another cruise for the good people over at Jazzdagen. We’ll be cruising the Rhone River from Lyon to Arles, France. I played another river cruise in France a couple of years ago through the Bordeaux region. It was absolutely gorgeous and quite delicious as well. I’m looking forward to making music with Antti Sarpila, Pieter Meijers, Eddie Metz Jr., Tom Hook and more. 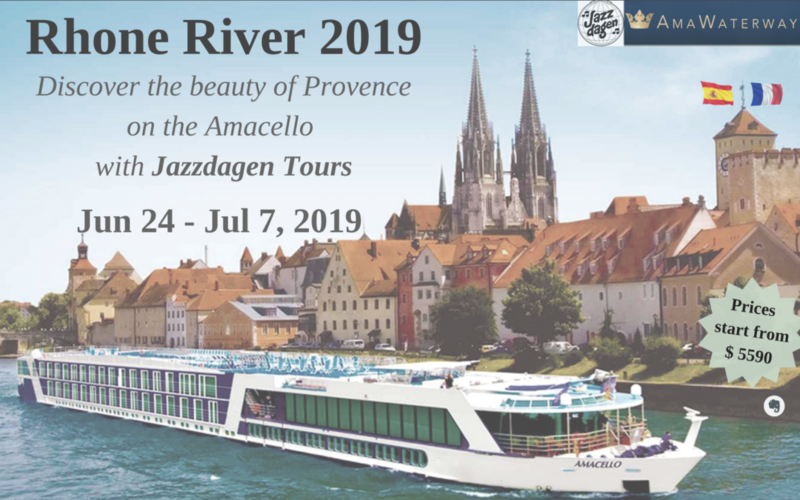 For those of you who haven’t been to the Copenhagen Jazz Festival before, this could be a nice excuse for you to continue your travels northward and join us for the festival after the cruise. **CLARIFICATION** It looks a little confusing with all the different dates floating around. They are offering some cool pre-cruise (Paris) and post-cruise (Barcelona) experiences. I will only be a part of the cruise itself from June 27-July 4. I won’t be hanging out in either Paris or Barcelona.